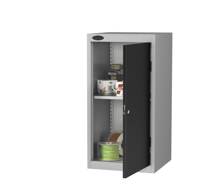 All cupboard components are manufactured from mild steel. Door frames from 1.0mm, doors from 0.9mm and carcass and panels from 0.7mm. 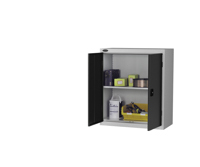 Shelf loading is a maximum of 65kg U.D.L. 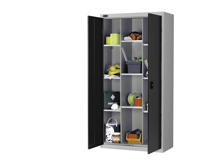 Features two partitions with 9 adjustable shelves. 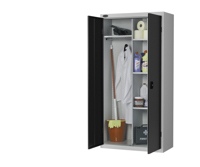 Incorporates a central partition with 6 adjustable shelves. 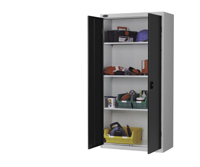 A central partition creates a useful mix of shelves and garment storage. Complete with 3 adjustable shelves. Complete with full width shelf and hanging rail.